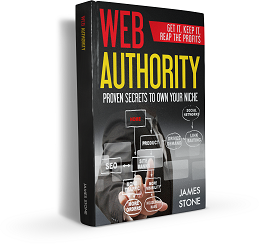 Web Authority by James Stone > Build a Business > What Creates Page Rank? What Creates Page Rank? Traffic and links are critical to an understanding of what the Internet is all about. Here’s a long explanation. Let’s start with links. Links are defined as a clickable word or phrase that, if clicked, will bring the reader to another page. There are many kinds. There is first, second, and third tier links, offsite links, onsite links, reciprocal links and more. There are people that link to your site from their website. There are people that link back to the people that you link back to. There are people that link to the link to the link back to you. Search engines like Google, Bing, and sites like Alexa.com use links as a way of quantifying your rank among all the other sites on the Internet. Website ranking is based in large part by how many and what kind of links you have. It is also based upon traffic numbers. The basic understanding you need is that links and traffic primarily govern your page ranking. If your pages ranks better than another site, the thinking among search engine experts is that the search engines will send you more traffic than sites that do not rank well. A lot of people will tell you they know for certain how the search engines will rank you, but how it is done exactly changes constantly. What I have taught is basic and probably won’t change anytime soon. For the purposes of this book, you need to realize that if you are always linking to someone else’s pages, then you are helping someone else’s ranking. For example, let’s say your site is five sites away, each site linking to each other, five tiers deep. A search engine comes along attempting to rank your site. (It is what you might call a “Web Crawler”.) It keeps following the links and finally ends up on the final site. The search engine now knows who provided the original information. That site is the end of the line, the source eternal. What I’m saying is that you want your site to be the source of that information as often as possible. The content, the patterns of keyword phrases the search engines look for, is what brings you the traffic and the links and ultimately the rankings. It takes time to get these kinds of links, but they occur over time on their own if you follow what I teach. You have to use your imagination here. Computers housed at search engine companies have the software that crawl your sites. They don’t care about the pictures and can’t enjoy any of the wonderful videos humans like to watch. To them, it is just words and patterns and it is just content. The search engines are constantly looking for new patterns and readjusting their indexes based upon content. They are like greedy word eaters thirsty for content patterns. That is why content is king and always will be king. My job is to make it easy and effective as possible for you to feed these engines what they want. Let me give you another visual of what a search engine’s world might be like. A friend’s website has been around for many years. This person has other websites, but brands the site using her name. If you took a look at all the people that have linked back to her site over the years, it would look like the biggest, craziest, oak tree. There are little bitty branches with leaves and everything else hanging off of it. It is a maze of brain neurons and the craziest jumble of interconnected links that you have ever seen in your entire life. That is a small example. How about other sites like Microsoft’s website? That site alone probably accounts for half of a percent of all the links on the Internet. That is even crazier to visualize in your mind. A very large percentage of websites on the Internet have reasons to link to a page somewhere on Microsoft’s website. Whether it is information about a fix to a bug or where to download a patch or a new product, almost all software that runs on any version of Microsoft Windows has some involvement with Microsoft. Think about how that is linked across the Internet and it boggles the mind. Search engines and sites like Alexa.com grade you on links as well as traffic. They grade you on how much traffic you have, and how much traffic you get from the links. If links seem to always point back to you, and the subject matter is about you and your topic, then you become the source of authority on the Internet. This is what we’re after. It is what I call Web Authority.